You can’t paint with light. You have to paint with paint. 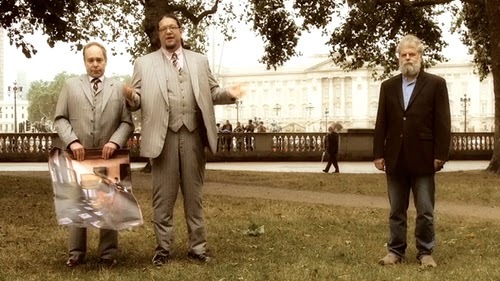 In which a super-rich pal of Penn Jillette learns to paint like Colin Firth in that period flick. You know, the one where he gets all weak-kneed over Scarlet Johansson. 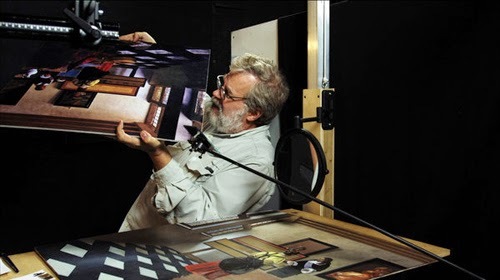 Tim Jenison, inventor and founder of software company NewTek, developed something of an obsession with the (possible) methods Johannes Vermeer used to achieve such striking paintings. Having conceived of means by which the Dutch Master went about his art, Jenison decided to put his theory to the test; he would attempt to paint a Vermeer. This documentary is a fascinating account of Jenison’s mission. Whilst Teller’s telling suffers from a one-sided approach, the idea at its centre is such a compelling one it leaves the viewer thirsty to understand the potential repercussions of the inventor’s (re-?) discovery. One can’t help wonder occasionally if the entire project isn’t an elaborate magic act courtesy of stage magicians Penn and Teller. After all, they are adept at apparently deconstructing their own craft only to reveal a Russian doll effect of deception beneath revelation. While this is evidently not the case, with art world luminary David Hockney weighing in and the project’s genesis resting with a book by architect Philip Steadman, which posited the idea that Vermeer’s photo-realism derived from the use of a camera obscura, Teller makes no bones about being fully on the side of Jenisen and his theory. 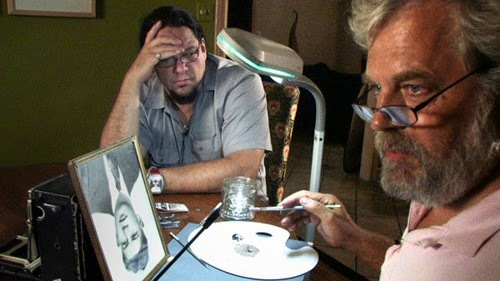 In interviews, Penn talked about how it was initially conceived as a piece about “Penn and his pal Tim”, while Teller has joked the documentary would have been just as worthwhile if Jenison had failed. The result of such deliberations, and sorting through thousands of hours of footage of Jenisen’s painstaking painting, is to focus on the non-painter attempting to be a painter. 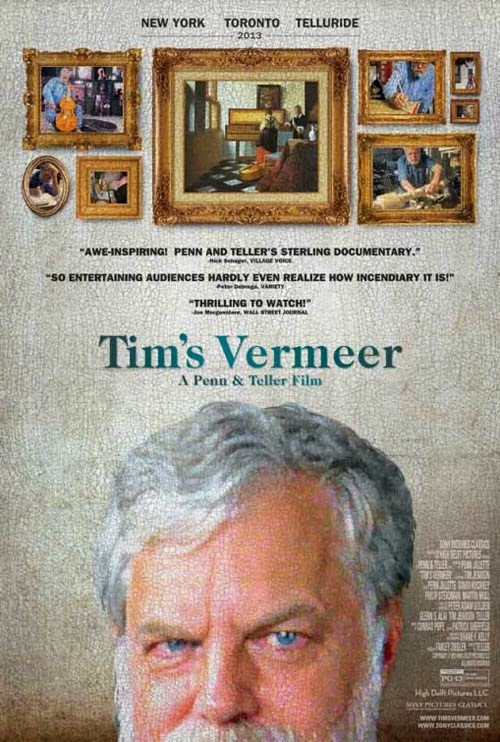 Inevitably this comes at the expense of the debate it ignites, and it’s this that ultimately prevents Tim’s Vermeer from crossing over into something more expansive and insightful. The kernel of the debate is retained, of course. That if an unrefined amateur like Jenisen can reproduce (in rudimentary form) a painting by the great Dutch dude then there can’t be anything all that special about what he did in the first place. 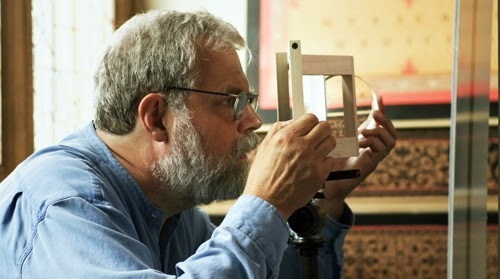 Teller’s tack is to emphasise that the use of optical devices to enhance painting technique is an achievement in itself; that is, the artistic impulse is demystified in much the same way the duo suggest stage magic is not really all that amazing actually. Yet their act usually pulls back with a renewed “How did they do that?” Tim’s Vermeer relishes the idea that any laymen can paint like a Dutch Master if only they put their minds to it. Art is no longer the preserve of the creative genius, so it’s no wonder the reaction from some quarters has been apoplectic. They’re killing a sacred cow here. The arguments against range from Vermeer’s skill with composition, to that of the core inner inspiration of the artist, and natural technique versus studied imitation, but they are mostly absent. Hockney labels the antagonistic stance, which announces that Vermeer wouldn’t have used optics as it would be cheating, a childish one. But it must be acknowledged; the cumulative effect of Teller’s documentary is to knock the artist from an unknowable pedestal (“He painted the way a camera sees”; essentially all he is doing is rendering very slow-developing photographs). It’s right there in Penn’s introduction, when he suggests the Vermeer effect is more than merely paint on a canvas; his artworks glow like the images on a movie screen. When a brain-care expert is wheeled out to attest that the human cerebrum would not allow the eye to see the way Vermeer paints (i.e. unaided), Teller seems to have moved to the position of forcing rather graceless points. Now all possibilities of aberrantly gifted individuality are Tipp-exed away in order to seal the deal. A much more compelling argument is the discovery of “The sea horse smile” in the motif Tim is copying. He notes that it is curved due to the curve of the mirror reflecting it. And then he realises the motif it is also curved on Vermeer’s original. This seems like a “case closed”, and Teller certainly imbues the reveal with an air of vindication. There are even avenues in respect of Jenison’s labour that deserve some elaboration but are left unexplored. He makes out that he is just a keen amateur, but there’s an element of “Try something new and succeed at it” from the man who invented the Video Toaster, the Electric Moth and the Lip-syncing Duck. He comments that the process was torture; he re-constructed Vermeer’s studio in a lock-up and set himself the task of using only materials available at the time, which required making his own lens, mixing his own paints and building a chair. The painting itself took 130 days to complete (and the idea took shape over five years prior to the events depicted). Yet the attention to detail involved on the part of Jenison is hardly dwelt upon. The whole business with the mirror, using the eye to blend the two images so that the paint (which has to be constantly altered to produce the desired colour tone) matches the reflection, is surely made to seem simpler than it is (certainly, as someone who has never found mixing of paints a satisfying experience). So when Jenison says “The process is objective. Any painter who uses it gets the same result” I wonder if he’s doing himself a disservice in terms of a certain skillset (which I’d define as a technical craftsmen of some dexterity, rather than necessarily an artist with flair to spare). Even beyond the conceptual leap Jenison makes in accounting for Vermeer’s facility with images, it’s his dedication to the project that most impresses. There are also a few lapses along the way that don’t serve the argument. Jenison being granted an audience with the original painting in Buckingham Palace, while P & T wait outside, serves only to highlight that we can’t really compare what Tim has done with the original in any substantially verifiable way. 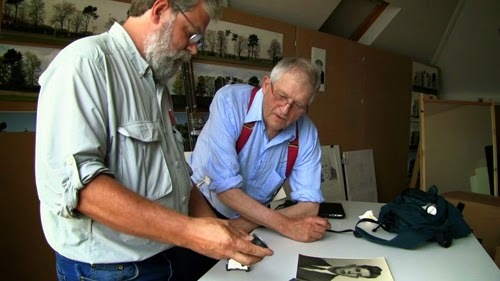 Hockney also has to tell prole Jensison at least twice that it’s no good wishing Vermeer had a document to prove he used a device like this; painters of the day were notoriously secretive even down to their paints, let alone something of this order. And besides, paintings are documents you philistine! Additionally, for all the attention to perfectly reproducing the tools of the seventeen-century, it isn’t clear how Tim adjusts for the changes in natural light throughout the day. 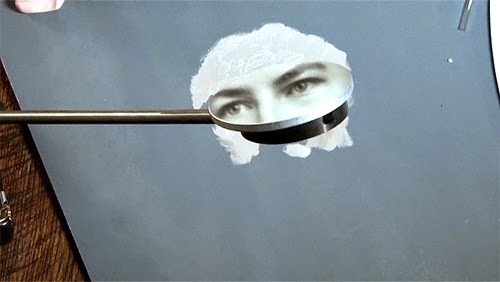 Still, this is an engrossing film based on a potentially game-changing intuition. It might have been a great one if Teller had taken the time to explore both sides of the fence.